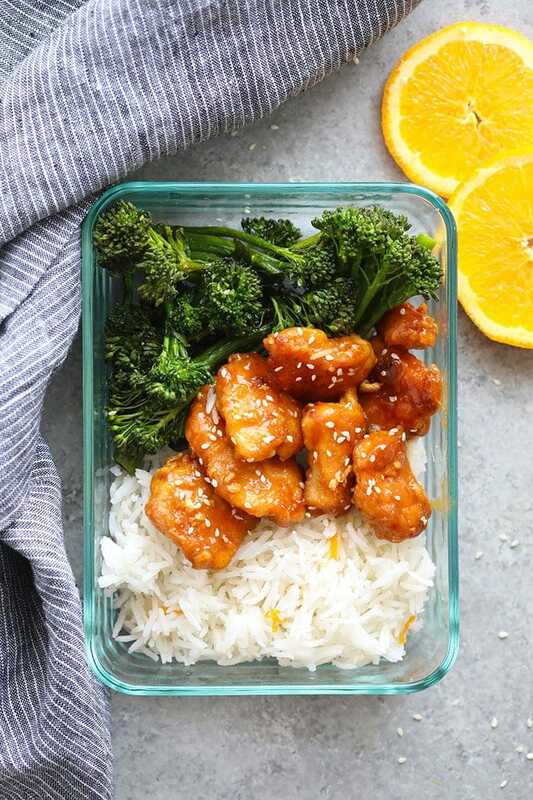 Looking for a better than Panda Express Orange Chicken recipe? 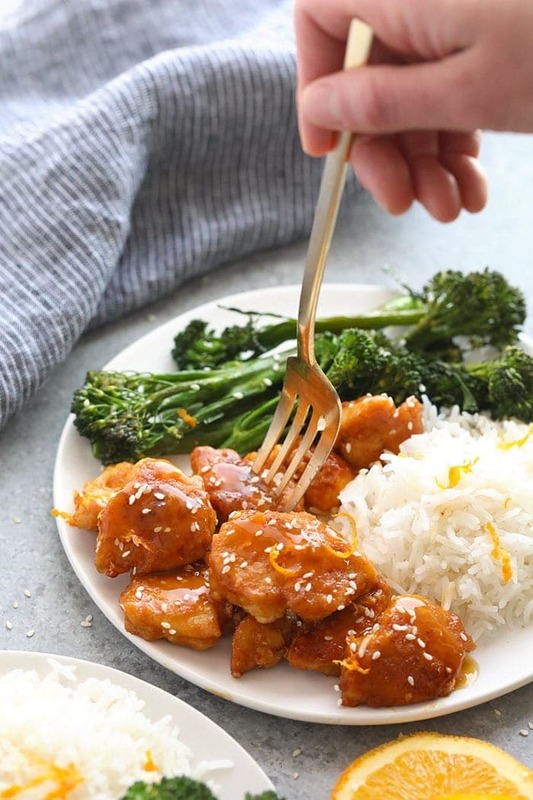 We’re sharing a delicious recipe for healthy orange chicken. It’s made with real orange juice, honey, a little sriracha AND…it’s not deep fried, but still has a crunch. 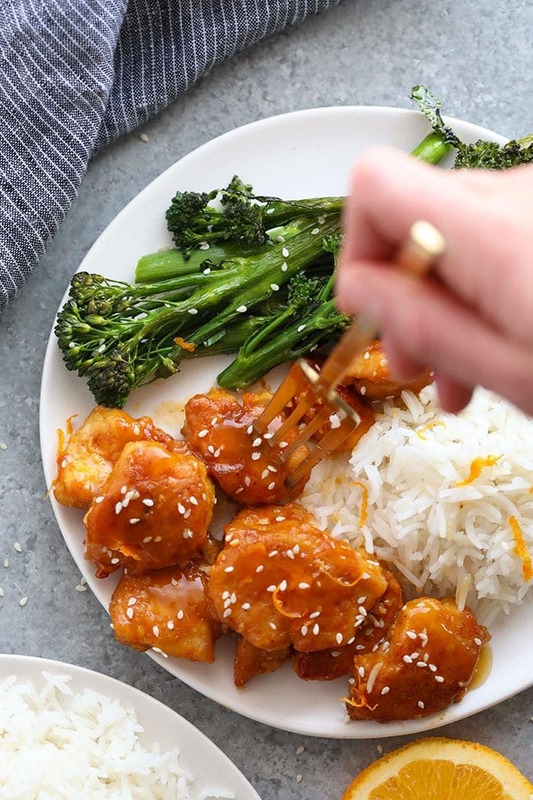 From one takeout girl to another, you’re going to be absolutely obsessed with this easy orange chicken recipe. 9 times out of 10, I’m going to choose some kind of Asian food for takeout. I’m a sucker for stir fry…especially when there is a good mix of protein and veggies! 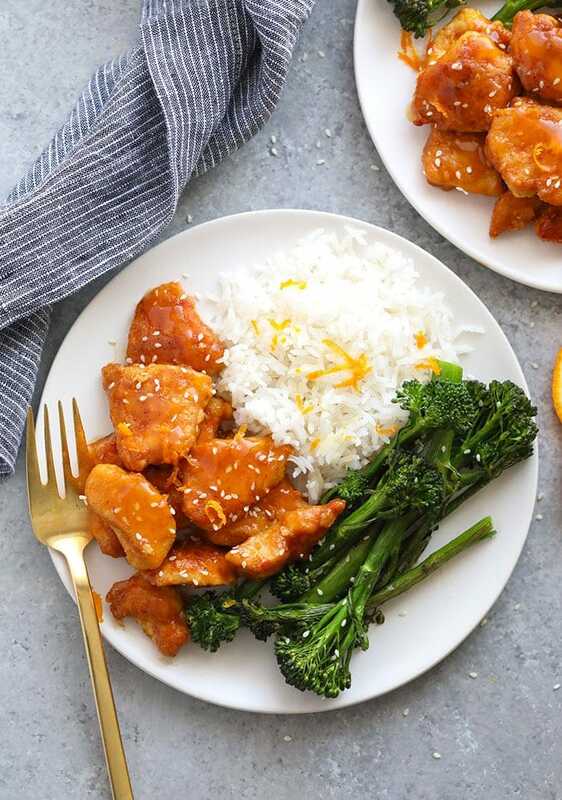 Classic orange chicken is deep-fried and coated in a sugary orange sauce…AKA pure deliciousness. 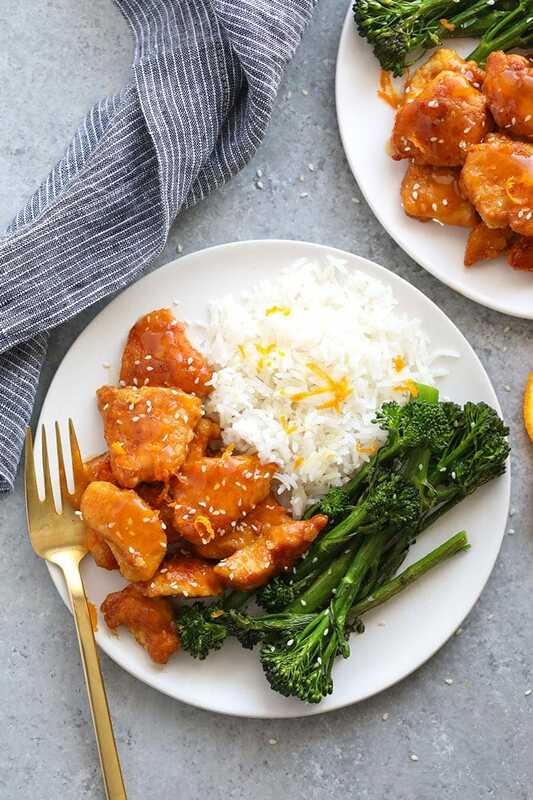 We wanted to keep these same flavors and textures, but really lighten things up with whole foods and the most amazing healthy orange chicken sauce. So how do keep the same flavors of Panda Express Orange Chicken while making it healthy at the same time? We have a few tricks up our sleeve and it really comes down to 2 parts: the chicken and the sauce. Typically for orange chicken, you’re going to need to deep fry the chicken in an oil such as canola. However, instead of fully deep frying, we’re stir-frying with much less oil while still getting that amazing crunchy texture! 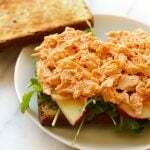 Begin by slicing your boneless, skinless chicken breast into small strips. Then, create your egg wash why whisking 2 eggs in a small bowl. Set aside. 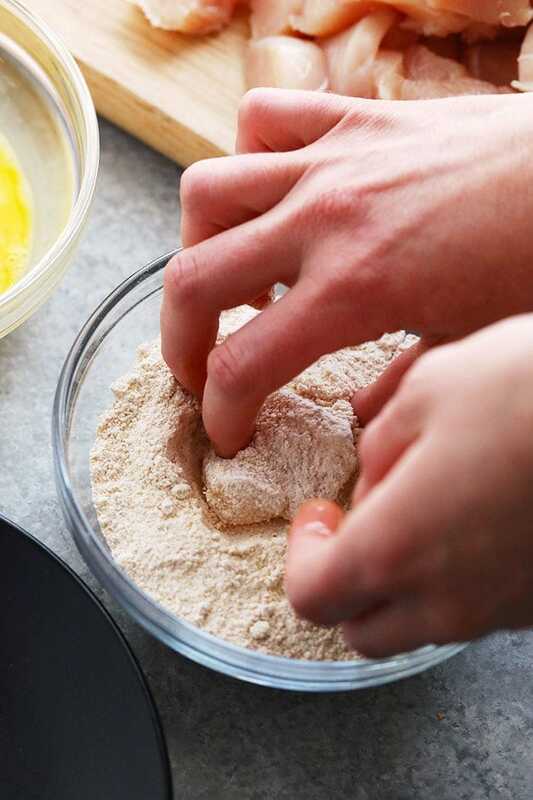 Create your chicken coating by mixing together flour (we suggest whole wheat), garlic powder, and salt. Dunk each piece of chicken in the egg wash and then full coat each side with the flour mixture. Repeat until all chicken pieces are coated. Heat coconut oil in a large frying pan and turn heat to medium/high. Cook chicken on each side for 3-4 minutes or until fully cooked and golden brown. Remove from heat. Once the chicken has fully cooked, place all chicken back in the frying pan and scoot to one side. Add orange chicken sauce and then sprinkle on cornstarch. Whisk until cornstarch dissolves and sauce begins to thicken. Then, toss the chicken pieces in the sauce. 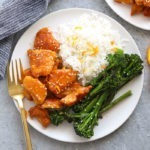 While the written recipe is how we prefer to eat this amazing orange chicken recipe, you can totally swap out a few things to make this recipe suitable for most diets. Gluten Free: Make sure to use tamari instead of soy sauce to keep the orange chicken sauce gluten free. You’ll also want to use a gluten-free flour such as all-purpose gluten free flour blend for the chicken. 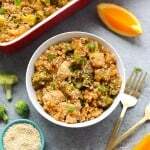 Paleo: To make this recipe paleo, use coconut aminos instead of soy sauce and a different, paleo-friendly thickener such as arrowroot starch instead of cornstarch. For the chicken, use a nut-based flour such as superfine ground almond flour instead of glutinous flour. 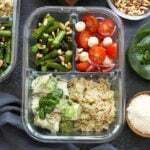 Keto: For those on the keto diet and wanting a lower-carb meal, start by halving the sauce (this is where most of the carbs live). Don’t worry, you’ll still have plenty to coat all of the chicken! For the sauce, use coconut aminos instead of soy sauce and remove the honey completely. Use arrowroot starch to thicken instead of cornstarch. For the chicken, use a nut-based flour such as superfine ground almond flour instead of glutinous flour. Again, like we stated above, we prefer to eat this delicious meal with the prescribed recipe! First, prepare orange chicken sauce by mixing together orange juice, soy sauce, honey, and sriracha. Set aside. Next, crack 2 eggs in a medium bowl and whisk until scrambled. Then, place white whole wheat flour, garlic powder, and salt in another medium bowl and whisk. Prepare chicken by thinly slicing into bite-sized pieces. Then, dunk each piece into the egg wash and coat with the flour mixture. Repeat until all chicken slices are fully coated. Heat a tablespoon of coconut oil in a large pan over medium/high heat. Cook chicken pieces on each side for 2-4 minutes or until fully cooked. Depending on the size of your pan, you may need to do this in batches. Add more oil as needed. Once all chicken is fully cooked, remove from pan. Then, add in sauce and sprinkle in 2 teaspoons of cornstarch. Whisk over medium-high heat until sauce has thickened and cornstarch has dissolved. Add chicken back in and toss in sauce. Season with fresh orange zest and sesame seeds. Serve with your choice of grain and veggie!